The wave petunia’s should be ready to sell by late April. The students have no fear getting down in the dirt when they are in class. POINT PLEASANT — Spring has come and flower planting has begun at the Mason County Career Center (MCCC). Future Farmers of America (FFA) students enrolled in Greenhouse Production and Management, Agriculture, Plant Systems Concentration, are currently growing wave petunias. Instructor Sam Nibert said he has 14 students in the class, three being seniors. As freshmen, students take Introduction to Agriculture, Food, and Natural Resources if they have an interest in agricultural studies. After taking the introductory course, the students are then able to find which concentration is best suited for them. The Greenhouse Production and Management students grow flowers, fruits, and vegetables. They are bringing in spring with tri-color wave petunias; they will be pink, lilac, and purple. The students regulate the temperature of the greenhouse, prepare the soil, monitor the PH level of the plants, water the plants, and keep the plants protected from insects. Nibert explained his students will have approximately 100-150 hanging baskets of wave petunias. 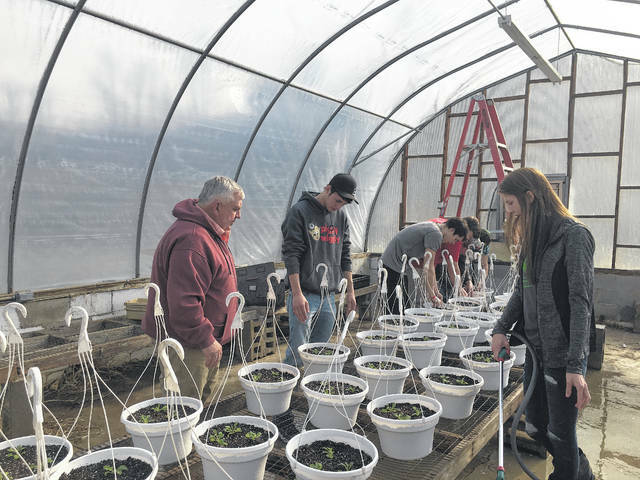 Once the plants are ready, which should be in late April, said Nibert, people will have the opportunity to purchase the flowers at $10 per hanging basket. Nibert said the purple wave petunias are the top seller. The students will then begin growing strawberries after spring break. The strawberries will be sold at $10 per 25 plants. Nibert said order forms will be coming out soon, those interested may call the MCCC at (304) 675-3039. The students will then begin on their vegetable garden. Nibert explained the students garden in the MCCC community garden located outside of MCCC near the greenhouse. The MCCC community garden was formed four years ago, shared Nibert. The primary vegetables grown are potatoes and are sold at 78 cents per pound. During school months, vegetables are sold to individuals within the school system and then during summer months, the vegetables will be sold to food pantries, senior citizen homes, and the homeless shelter. Nibert said the funds earned from what the students grow is put back into the program for future projects. Nibert said his students not only learn about the responsibilities of caring for the plants, but learn about the financial aspects of agriculture. He shared his students learn how to put business plans together. “The most inspiring part of this, working with these kids, is seeing the interest of the kids…like going to Bob’s Greenhouses and picking those plugs up…they were just overwhelmed by what they had over there, coming back with those plugs, to the see the expression on the kids’ faces, and them come back and talk stories about what they witnessed,” said Nibert. Nibert explained his students can pursue careers at places such as Bob’s Market and Greenhouses, farming and tractor supply stores, as well as being able to do any plant system jobs or be an entrepreneur. https://www.mydailyregister.com/wp-content/uploads/sites/24/2018/03/web1_0323-1-.jpgThe wave petunia’s should be ready to sell by late April. 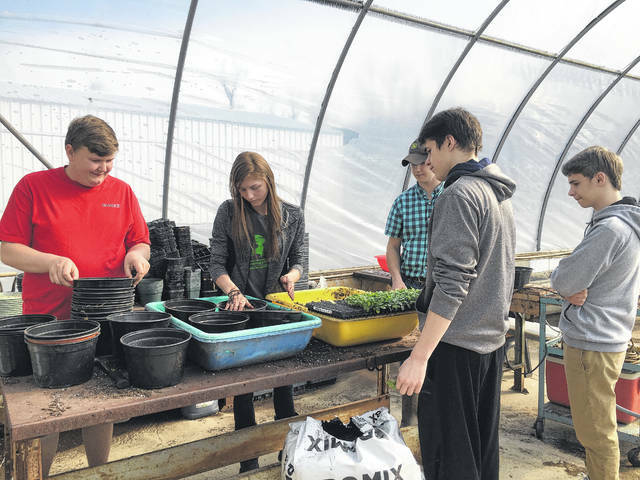 https://www.mydailyregister.com/wp-content/uploads/sites/24/2018/03/web1_0323-2-.jpgThe students have no fear getting down in the dirt when they are in class. Erin Perkins is a staff writer for Ohio Valley Publishing.